Just because summer months are the most arduous in Columbia – temperature wise – does not mean runners must resign running shoes to a box under the bed. Although mild weather in fall, winter, and spring is ideal, summer can have its rewards. The key is to run smartly. – Avoid, if possible, the hottest part of the day, which is between 10 a.m. and 4 p.m.
– Wear light, loose clothing to reflect heat and allow for sweat evaporation. – Wear a sunscreen with 45 SPF or higher. – Stay hydrated; a few glasses of water before running is advised and then carry a bottle or wear a hydration pack and sip at least every 15-20 minutes. – Make sure electrolyte and salt intake is replenished. – Run on shaded trails if possible. – Check weather advisories to learn if there are any particular issues regarding air pollution or excessively high humidity, for example. – Pay attention to any dizziness, faintness, or nausea during and after running. Consult a physician if it continues after hydration and replenishment of electrolytes and salt. If there are any respiratory or heart conditions, or if medications are taken, consult a physician to learn if summer running is a good idea. Check out running sites to learn of any summer events that will truly inspire. For example, Strictly Running hosts its Hot Summer Night 5K August 4th at 7 p.m. and offers to runners all kinds of summer fresh fruit for refreshment. Visit mapmyrun.com for a host of running paths – including the distance for each. Everything from a mile to 15 miles is routed. Two most popular paths are the Riverwalk and Timmerman Trail. The main entrance to the Cayce / West Columbia Riverwalk is located at the intersection of Axtell Drive and Naples Avenue. You can also access the park at the intersection of State Street and Lucas Street. It meanders on stable footing for 8 miles in one direction and runs from Gervais Street to Knox Abbott Drive. There is also access at Columbia Canal and Riverfront Park, just off Huger Street. The Timmerman Trail, a little over 6 miles, can be accessed from the 12th Street Extension at SCANA Parkway or after the Cayce Tennis Center at the 12,000 Year History Trailhead. Timmerman Trail is well maintained, has plenty of shade, and much of it is located next to streams, creeks, and swamps. 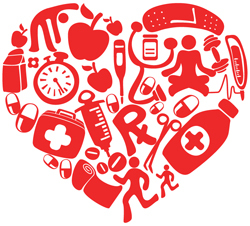 According to the American Heart Association, heart disease and stroke are the #1 cause of death and disability for all Americans — heart disease is responsible for an average 1,690 deaths each year in just the Midlands. However, more than 80 percent of risk factors for heart disease and stoke are preventable through a healthy lifestyle. A healthy diet and lifestyle are the best and easiest ways to fight cardiovascular disease, and by making simple steps and improving your overall pattern of choices, you can create long-term health benefits for yourself. Make better food choices, making sure to include a variety of nutritious foods from different food groups. Nutrient-rich foods have minerals, protein, whole grains and other nutrients but are lower in calories to help you control your weight, cholesterol and blood pressure. Include a fruit and/or vegetable at every meal and snack. Eat a variety of fresh, frozen and canned vegetables and fruits without high-calorie sauces or added salt and sugars. Replacing high-calorie foods with fruits and vegetables can improve your health and weight. Try to eat 8-10 servings, typically ½ – 1 cup, of fruits and vegetables daily. Replace white breads, sugary cereals, refined pastas or rice with whole-grain versions, which are rich in fiber. Fiber is also found in the peels of fruits and vegetables. If you choose to eat meat, look for the leanest cuts available and also prepare them in healthy ways. Replace these with the better fats, like monounsaturated fats (olive, canola, peanut, safflower and sesame oils) and polyunsaturated fats (soybean, corn and sunflower oils, as well as fatty fish). If you need to lower your blood cholesterol, reduce saturated fat to no more than 5 to 6 percent of total calories. For someone eating 2,000 calories a day, that’s about 13 grams of saturated fat. Avoid foods containing partially hydrogenated vegetable oils. To lower blood pressure, aim to eat no more than 2,400 milligrams of sodium per day. Reducing your daily intake to 1,500 mg is desirable because it can lower blood pressure even further. If you can’t meet these goals right now, even reducing sodium intake by 1,000 mg per day can benefit blood pressure. You could use your daily allotment of calories on a few high-calorie foods and beverages, but you probably wouldn’t get the nutrients your body needs to be healthy. Limit foods and beverages high in calories but low in nutrients. Read Nutrition Facts labels carefully — the Nutrition Facts panel tells you the amount of healthy and unhealthy nutrients in a food or beverage. This requires knowing how many calories you should be consuming, depending on your age, height, lifestyle and gender. Know your portion sizes and use portion control in all meals. Prioritize regular physical activity — this can help you maintain your weight, keep off weight that you lose and help you reach physical and cardiovascular fitness, as well as lowering blood pressure and cholesterol. Choose a healthy lifestyle, not just in your diet but also your decisions. · If you drink alcohol, drink in moderation. The large meals and long naps have finally come to an end, and it’s time to get back on track. We’re sharing our top five New Year’s Resolutions with you. Even more, we’re sharing how to keep those resolutions. Join us in making healthful and smart choices this New Year! Workout: One of the most popular New Year’s resolutions is to begin working out or workout more frequently. Although many people make this resolution on January 1st, most of us lose focus of this goal rather quickly as the weeks and months go by. This occurs for multiple reasons, one of which is the motivation factor that must accompany any workout routine. It’s often difficult to find the motivation to go to the gym, but finding a gym that you enjoy visiting can be one way to maintain motivation. There are a plethora of gyms to choose from throughout the Midlands area. Anytime Fitness, for example, is located on Devine Street and open 24 hours a day. If you are a night owl or an extremely early riser, this could be a great choice. Doctor’s Wellness on Beltline offers group workout and yoga classes, as well as “Healthy in 12®”– a 12 week medically based lifestyle program targeting overall nutrition and physical fitness. Another option is 9 Round Fitness on Forest Drive. This gym offers a 30-minute workout consisting of nine rounds of intense stations that work each muscle in your body. Personal trainers are on site to encourage and push you to reach your goals. Where and when you choose to workout depends greatly on your goals, personality and schedule. The most important tip is to have a steady workout routine. Your routine may be waking up before the sunrise and heading out for a quick morning run, an intense 30-minute gym visit, or relieving your stress from a long work day at the gym in the late evening hours. No matter what your new workout routine is, take it slow and enjoy keeping the healthful resolution all year long. Eat Healthful Foods: Another popular New Year’s resolution is to eat better, more nutritious foods. To live a healthier lifestyle, working out goes hand in hand with eating healthy. Although this resolution is made every year with good intentions, it’s often difficult to stick to when it’s been a stressful day and you’re ready to go home, order takeout and catch up on your favorite television shows. The positive effects of working out on a regular basis will quickly diminish if you don’t follow a healthy diet. The good news is that following a healthy diet is easier than it ever has been. With websites such as Pinterest full of healthy recipes as well as restaurants like Good Life Café with many organic, healthful choices, the options for healthful eating are endless. Find recipes you enjoy cooking and eating. Prepare food in advance and treat yourself occasionally after a week of good decisions. Read our article from last January on how to follow a natural detox to get your healthy eating started. Lower Stress: Stress levels seem higher today than ever before. We stress about work, family, friends, the economy, politics … the list goes on and on. Believe it or not, there is a healthy level of stress. Healthy stress makes us work harder, perform better and often accomplish things we never thought possible. However, when stress gets in the way of our goals, causing us to begin to break down, it becomes a negative factor. Often, the holiday season is a negative stress inducer. In our Happy Holidays article, Thomas Barbian, Ph.D. explains that the holiday season can often add stress to an already stressful life, taking away the joy and gratitude that should be associated with this special time. To manage stress during this time and throughout the year, Dr. Barbian suggests exercising regularly, eating healthily, getting enough sleep, refraining from the use of alcohol, drugs or food to ease stress, and breathing well. From a lifestyle perspective, Dr. Barbian suggests managing time wisely, making time for hobbies, learning to say “no,” and spending time with people you enjoy and love. Follow these tips to prevent stress in 2017. Volunteer: Investing your time into an organization that is making a difference is one way to give back to your community. Finding something that you are passionate about and feel you have a lot to contribute toward is the key to sticking to this New Year’s resolution. If you are devoting your time to a cause you truly care about, it will be easy to devote time to the cause as the days, weeks and months go by in 2017. Volunteering at a local organization not only helps the organization and the community, but it also can be extremely beneficial to your own well-being. Helping others is one of the best ways to better yourself, and volunteering is a wonderful resolution to make and keep in 2017. Save Money: After the gift giving that goes along with the holiday season is over, the resolution to save money in the New Year is always a top priority. One way to keep this resolution throughout the entire year is to make and stick to a set budget. Accounting for every dollar you spend will help you see where you are wasting money and what areas you can cut back on to save money. If you have credit cards, make sure they offer rewards that suit your lifestyle. For example, if you are constantly on the road, open a credit card that gives you cash back for money that you spend on gas. If you frequent the grocery store for your family, a credit card that offers points or cash back for groceries is a great option. If you enjoy traveling via airplane, research credit cards that will give you points toward plane tickets. Talk to local banks and credit unions such as AllSouth Federal Credit Union and First Citizens Bank about what the best options are for your finances. Also, talking to a financial advisor about the best way to invest and save may be a great way to start your 2017. Happy New Year from all of us at Columbia Metropolitan. We wish you a wonderful 2017!